If you missed my last post and challenge, start there before getting caught up! Hurricane Irma was pretty scary even as a native Floridian, and it was one of the strongest hurricanes ever. Things turned out to be much better than expected for Tampa (my hometown) and Tallahassee (where I am now). “Let me just brag on my school for a minute…. I stayed at FSU’s shelter for off-campus students (mostly to ease my mother’s worry) and take all possible precautions. Irma’s scary. At the center, we were greeted by officers and staff, who were all so friendly and happy to have us. We were told to bring one bag, our own sleeping supplies, and our own food and water, as “nothing would be provided”, but staff members went around last night to make sure everyone had a (somewhat) comfortable sleeping arrangement on the ground. If they didn’t, they provided cots and blankets. Staff and guards were stationed around the center all night, to make sure we felt safe and cared for. Even though we were told no food would be provided, they brought out donuts and juices for breakfast, and pasta and sodas for lunch. They also brought out a bunch of board games and frisbees, as well and playing a variety of movies last night and today. In addition, we were joined by Mr. and Mrs. President Thrasher at lunch time, who walked around and greeted and chatted with the students, and stuck around to make sure everyone was fed. We didn’t even lose power, and the storm could’ve been a lot worse. But as a scared 19 year old packing up to take shelter, and not knowing when I’d return home, there was nothing more they could’ve done to make me feel comfortable and safe. Maybe it doesn’t sound like much, but in these times, those little things make a huge difference, and I won’t forget this sleepover at the Civic Center for a long time. We ended up losing power at my house here in Tallahassee for a mere 2 hours, so we were incredibly lucky. Tampa lost power for much longer, and my sister at Clemson has been without power for about a day. Before Irma even made landfall in Florida, FSU cancelled classes for the entire week, which is just fine with me. I’ll be spending this time blogging, painting for my store (I’ll get to that in a second), and finally organizing/decorating my new house! Right after sorority recruitment was over, we got right into fall classes (at least for two weeks before Irma hit…). I’m taking 16 credit hours this semester, and three of my classes are specifically for my major, which is exciting. I’ll definitely be busy this semester, but I’m really enjoying my classes so far. For those who don’t know, I’m a second year political science and business student, and I plan to attend FSU’s law school post-undergrad. Some people have also been asking for an update on my house! I’ll definitely do a full house post sometime when things are all finished (which they are not), or at least more decorated. Because I plan to go to law school here in Tallahassee, my family made the decision to buy a townhouse off campus for me to live in. My lovely roommate from last year lives with me as well! We’ve been working hard to renovate the house since February, and it’s definitely been my greatest adventure so far, but it’s so exciting, and I’m so incredibly thankful. With the craziness of recruitment and the beginning of classes, I didn’t have much time to decorate, but I’m slowly starting to organize things and hang things up! Now that I’m not living in a dorm, I can finally have some house plants! I purchased my first little succulents from Home Depot while I was home for Labor Day, and I’ll definitely be adding to my plant-fam soon. I already shared the news on my Instagram, and you may have noticed the “STORE” addition to my blog menu so the secret’s out… I opened my own Etsy shop!! This is something I’ve wanted to do for a long time. I’ve always loved to paint and have always dreamed of having my own business or store, so PaintedGracebyKS was born! I already sold some of my initial inventory, but I’ll be spending most of this week painting and adding some new things, like the canvases below, and this wooden cross I painted for my room. 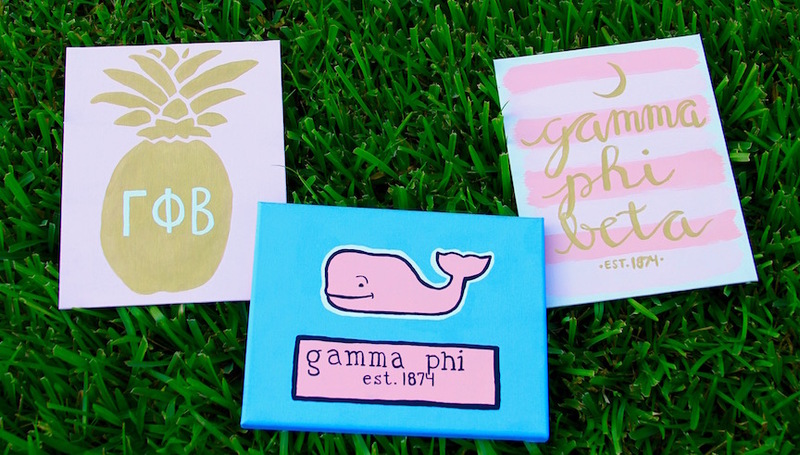 I’ll be making hand-painted custom sorority, quote, faith, and other canvases! If you’d like me to make something special for you, don’t hesitate to ask! I just recently made my very first sale, but I’m already loving being a shop owner and getting to share my creations with the world. sending out my first sale! This is such a great alternative to a part-time job for me, and I’ve been an Etsy fan for years. If you’d like to see an entire blog post all about my store, just let me know. You can visit my Etsy shop or find out more by clicking here! I’m a person that likes to be busy. Currently, I’m balancing a full school schedule, a sorority, this blog, and now my own store, in addition to everything else. I’ve challenged myself to do more this year, while pushing myself outside my comfort zone. I always say that everything happens for a reason, and the bigger the challenge, the bigger the payoff. I’ve challenged myself to build a life I love, and I’ve definitely done that this year. I’m proud of where I’ve been and where I’m going. Thanks for being a part of my journey. Life can get crazy and busy and stressful, but God is always good. I also just updated my 2017 Goals! Irma gave me some downtime to write some blog posts that’ll be up soon, but in the mean time, you can connect with me on social media! So cute! Excited to see how your school year turns out & im glad you were safe during Irma! God Bless! So glad that you were okay! Irma was definitely scary! And those painting are so cute!! Thank you, Allison!! It was definitely scary indeed, but I’m spending my week off adding to my painting collection! 🙂 Blessings! Hey Kristen! I’m glad the hurricane was not as bad as we thought it would be. I’m from Miami, and we lost power for about 3 days. Thankfully, things are slowly going to back to normal. I hope they are for you, too. Ahh I’m so sorry! I’m glad things are improving for you though, they are here, too! Blessings! Glad you are okay! By the time Irma hit where I live it was just a tropical storm and I was still scared. 😳 Your house is so cute!! Thanks girl!! Ugh yes it was scary all the place. I’m glad it’s over now!